Isekai Izakaya Nobu - Chapter 75 - AnythingNovel.com Read online any english novel around the world. Ignaz and Camil showed their faces at Izakaya Nobu during lunch the next day. Although the sign curtain hadn't been put out, it seemed that they served lunch to regulars in the shop. They could see a handful of customers enjoying their delicious food, but upon noticing that Gernot wasn't there, they wondered if he would show up today. They had visited the shop twice before, but they still found it strange. This shop, which was full of eccentricities, possibly contained some clues to new ways of selling their rice. They were greeted by Shinobu, as well as another waitress. They also noticed that there was one more chef. It seemed that the adorable waitress, Eva, who often ran around waiting tables in the shop, wasn't around at this time. He handed her a bag filled with polished sassarica rice. The grains were shorter than those of comune rice, which was commonly eaten in the Holy Kingdom, and it became slightly sticky when cooked. Shinobu passed the heavy bag to Taisho after taking out a handful of rice and sniffing it. Without further ado, Taisho measured out a portion of the bag's contents, then proceeded to wash it with water. His actions showed that he had repeated this process tens of thousands of times. The other chef was captivated by the appearance of Taisho washing the rice, which emitted a soothing atmosphere. Shinobu asked Taisho, who was checking the sassarica rice's texture several times. For a while, only the sounds of rice being washed echoed in the shop. A smartly-dressed regular, who was eating tempura, had been looking over at them curiously. He finally gave in and opened his mouth. The staple food of Aitheria was either bread or oat porridge, after all. There was no established habit of eating rice. The guest named Arnoux folded his arms, but not much was expected from him. What kind of advice could come from a man who looked like a gambler? There was probably nothing that could be done for this situation after all. Winter was when food shortages were common. If they lowered their heads and got a few referrals, some of the rice could be sold. Actually, it probably wasn't too late to get referrals, since winter wasn't over yet. Taisho, who had finished washing the rice, was skillfully cutting some vegetables and chicken into bite-sized portions. It was clear what Taisho was thinking about when he mentioned bigger flames. Once Izakaya Nobu popularized rice dishes, people would learn how to cook them at home. If that happened, more rice would be consumed than would have been possible with only Nobu, and people who were unable to come to the store could enjoy rice cuisine as well. 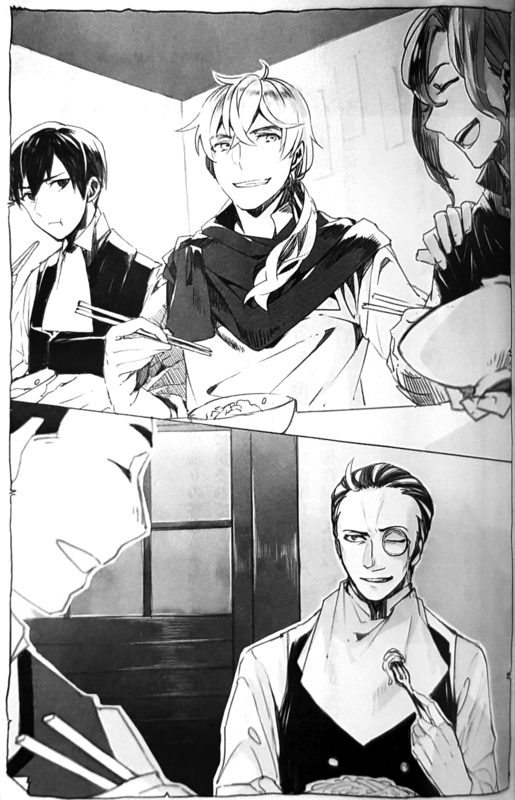 The other chef, who had a baby face, responded energetically and presented plates of food to Ignaz and Camil. Taisho began to explain. It was rice shaped into a rounded triangle and grilled with sauce spread on top of it. The fragrant smell was irresistible. When Ignaz took a bite, the grilled exterior was crunchy, but the interior was fluffy. It was delicious. The strong flavor of the seasoning was really good, too. After getting drunk on alcohol, this flavor was a welcome change for the stomach. When Ignaz looked at his partner, it seemed that Camil had noticed the same thing he did. When they had eaten kaisen don in this shop in the past, they ate it with a seasoning called ’’shoyu’’. (TL note: shoyu = soy sauce) Since they liked it so so much, they had tried searching everywhere, but that seasoning didn't exist in the Empire. A sigh and a voice of disappointment was heard in the shop. Since he didn't know where to stock it, was shoyu a secret recipe? If it was a seasoning that could only be used in Nobu, then it couldn't be used to promote sassarica rice sales. Even if it was this delicious. Shinobu nodded in response to Taisho's muttering. From then onwards, various opinions were put forth. Isaac, a man who was with Arnoux, suggested using fish sauce (Fischsoße), which was made out of bagangan, instead of shoyu, but the waitress Leontaine shook her head. Fish sauce made from bagangan, which was a small fish commonly caught in Aitheria, had a similar saltiness to shoyu, but it had a unique smell. There was a method for concealing the smell using ginger (ingwer), but she said there were already more than enough difficulties in cooking takikomi gohan with the sassarica rice. Shinobu put her chin on her hands and also fell silent. Various ideas were passed back and forth, but only time made any progress. Arnoux whispered something to Isaac, who shook his head. Without the fragrant smells wafting from the iron pot, this heavy pressure might have caused someone to break down. When the sunlight that shone through the glass door was about to change from day to dusk, someone began to knock on Izakaya Nobu's door. Gernot, who entered, seemed to be as calm as usual, but Shinobu guessed that he had rushed over here. His face had a light sheen of sweat. When Ignaz got up to update him about the situation, Gernot respectfully bowed to Arnoux. At the unexpected mention of the marquis title, Ignaz couldn't help but stare at Arnoux. Incidentally, the news about the feudal lord of Sachnussenburg passing on his title before the beginning of the year had been a huge topic of discussion. He had heard that the new lord was young and fresh-faced, but he never thought that he'd be he'd be this young. Gernot took out a sheet of parchment paper from around his chest and handed it to Arnoux. It was made of high quality parchment, which was used for administrative documents. A smile began to form on Arnoux's face as he looked at the document, and it slowly grew. When Arnoux handed the parchment over to Isaac, he was instantly displeased. Camil was wondering what was written on it, when Isaac tossed the parchment paper to him. As Camil panicked, Ignaz snatched the paper from him and skimmed through it. It was written that the Marquis of Sachnussenburg would buy the sassarica rice at an appropriate price. Of course, no one had signed it yet. Rice met the condition because it wasn't a perishable item. There were no objections, as it was also cheap. After all, it was bought at one-third the average market price. If the marquis was willing to buy it, they could sell it for a hefty sum. Apparently, Arnoux thought of the exact same thing as Gernot. Arnoux was the marquis, so why was Isaac opposed to his plan? Nobles were surprisingly particular about conventions. It was said that only one kind of crop should be stored in the warehouse. Gernot took out another sheet of parchment paper of parchment paper from his chest. Arnoux slapped Gernot's shoulders several times as he laughed. Gernot bowed deeply while answering that ill-natured question. Laughter filled Izakaya Nobu until Shinobu called out to everyone. Everyone turned to peer over the counter as the lid of the iron pot was removed, and a mild, fragrant aroma rose along with the steam. Ignaz's stomach, which had only consumed one piece of yaki onigiri since the afternoon, was rumbling with hunger. Hans filled the rice bowls as Leontaine skillfully set the table. Using a wooden spoon, Ignaz took his first bite. The flavor had been fully absorbed by the rice. It gave off a completely different impression than a simple stew. The chopped ingredients were simply side dishes, which allowed the contents of the rice bowl alone to stand as a complete meal. It was delicious no matter how he ate it. As he used his spoon to scoop mouthful after mouthful, he consumed the rice bowl in a blink of an eye. Arnoux and Isaac had also started their second bowl as new customers opened the glass door and entered, drawn in by the drifting scent. As he watched the delighted expressions on the faces of the guests eating the takikomi gohan, Ignaz gave Camil a knowing pat on his shoulders.